Definitions vary between what constitutes an accelerator versus an incubator and the contrasting strategies therein, but the overall goal is generally the same. Both aim to increase the odds of building a successful business in exchange for a small chunk of equity. Rather than trying to force ‘accelobator’ or ‘incuberator’ into the lexicon, the terms are used interchangeably for all programs that are included in the analysis. 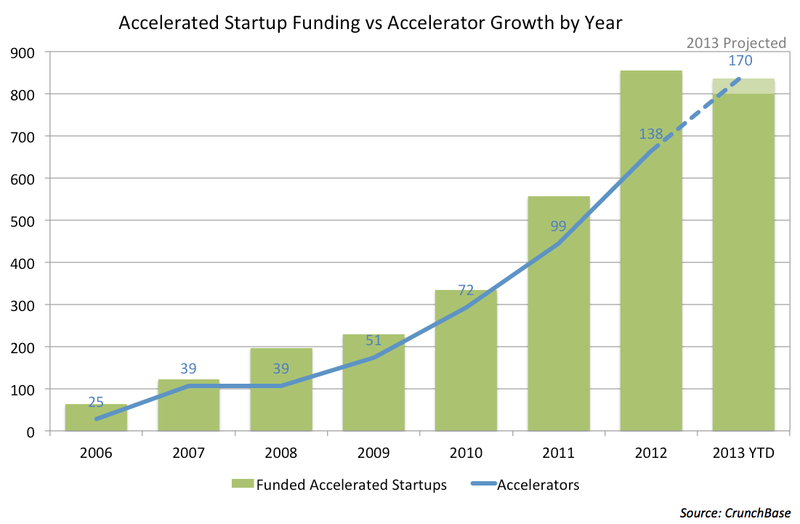 We’ll leave further analysis of success by the many types of accelerators out there for separate articles. The first modern accelerator was Y Combinator, a self-described seed stage venture fund, that announced its first batch of eight startups in 2005. TechStars, SeedCamp and Founder Institute followed shortly thereafter. Each year, the trend has continued to spread both domestically and internationally. One of the positive effects of tech accelerators has been their role in rapidly globalizing the startup community by removing the barriers to entry and providing access to capital for young companies that do not have the benefit of being headquartered in Silicon Valley. In the past two years, 388 international startups (from 49 different countries) were funded by 80 international accelerators or incubators (representing 36 countries). That is twice the international presence of accelerators as in 2009, and nearly three times the diversity of companies. Small, community-based programs supporting the growth of local businesses has played a huge role in the spread of startup fever across much of the world. Not surprisingly, Silicon Valley-based firms are racing to get on the ground in Europe and elsewhere to take advantage of new opportunities and talent. Just recently, 500 Startups announced on stage at Disrupt that they will open their first European office in Berlin as early as next year. This trend is so pronounced, that 2013 is the first year in which accelerator investments in North America actually decreased. We’ll keep in mind that there are plenty of ‘stealth’ companies partnering with accelerators now that could likely emerge in the coming months. The accelerator and incubator craze is such a new trend in venture investing, that it’s difficult to compare the success of these programs to that of later stage venture capital firms. While the first few accelerators have already recorded acquisitions and even a few IPOs, the large majority of accelerated startups are still in relative infancy. For every high profile exit from accelerator graduates like Reddit, OMGPOP, DailyBurn, SocialThing and GridBlaze, there are many more young startups continuing to perfect their products and services and seeking additional venture funds. One great indicator of a successful program is how much funding graduates can continue to attract in their first year or two. Overall, only a fraction of companies in CrunchBase that were funded by an incubator or accelerator program were able to find follow-on venture funding. The chart below illustrates the difficulty of reaching that goal. Just 27% of companies were able to secure outside funding within one year. Ultimately, just 36% of accelerated companies since 2005 added to their seed and angel rounds. Startups that launched with the assistance of an accelerator and failed to quickly find traction were mainly ignored by investors after just a year or two. 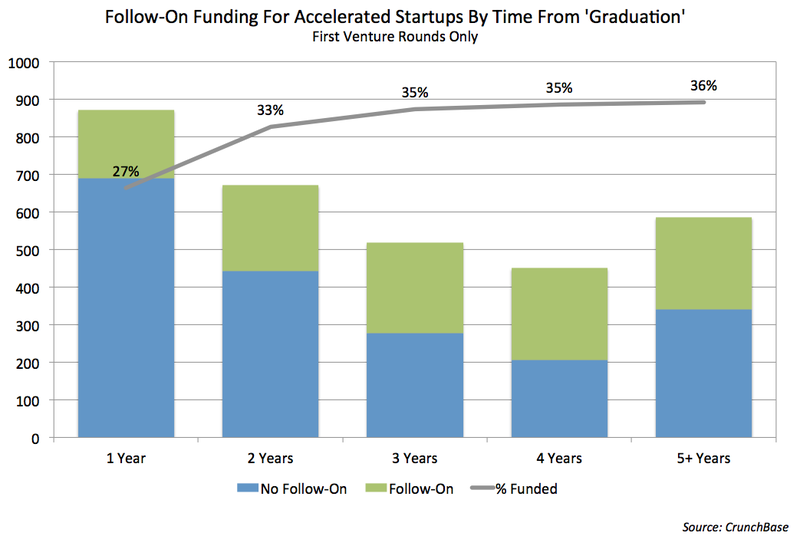 Despite the overall trend, graduates from the top accelerators have seemed to enjoy their pick of VC partners. Y Combinator companies like Airbnb, Dropbox, Pebble and Crowdtilt have raised massive Series A rounds just a few years removed from the program. According to the New York Times, 72% of Y Combinator companies through 2012 raised money after their Demo Day, and the majority of these companies have raised increasingly larger rounds. The growth of accelerators and incubators is clearly one reason for the record number of angel and seed investments in 2012 which we explored earlier. Just as the number of angel deals in 2013 likely will not reach the 2012 peak of 1,520, it looks equally unlikely the number of companies funded by accelerators will surpass 2012 levels. Although there are now more accelerators and incubators than ever, the total size of their portfolios appears to have leveled off in 2013. We can speculate that the proliferation of accelerators has reached a tipping point where there are now not enough quality founders and startups to justify continuing to expand their portfolios. There is little doubt that accelerators give opportunities to companies that may not otherwise have access to the expertise needed to grow a business from an idea to a product or service. However, most startups are destined to fail. Only a few prestigious programs have established enough of a sterling track record to consistently lure the most promising founders and companies. In a guest post on TechCrunch last year the founder of YouWeb incubator, Peter Relan, posited that 90% of incubators would fail due to the fact that much like the rest of the startup ecosystem, there can really only be a handful of winners. While accelerator programs continue to form, there is still a limited number of venture funds able to finance the next level of growth. The one-size-fits-all accelerator model of making lots of small bets seems more appealing than ever for investors looking for the next record IPO, but savvy startups can learn from the data and see that there is still no guarantee for more funding. To follow the trends with accelerators and startups, use the latest CrunchBase data set to take a look for yourself. Download the October 2013 Data Export and let us know what you find.